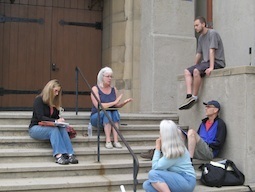 NELA & Throop volunteers created a bold vision for the south lawn of Throop Church. Months of planning and brainstorming sessions took place, with permaculturalists, avid gardeners, urban farmers and novices alike contributing to a vivid discussion of what would go into the project. Groundbreaking kicked off as NELA Transition & Arroyo Time Bank Volunteers stripped the Bermuda grass, and relocated or removed the existing exotic plants. Volunteers working with contemporary artist Ron Saunders constructed an interpretive "village" at the garden site out of cardboard. 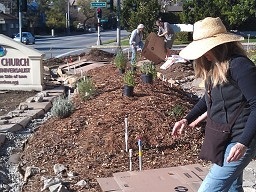 The materials used in the art project were later incorporated into the garden mulch. 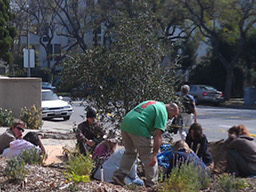 NELA & Arroyo Time Bank volunteers installed irrigation and "French drains", were taught how to use an "A-frame" to map land contours, discussed swales and berms, installed decorative pavers along the pathway, pruned the existing trees, removed the remaining existing plants, and began work on the retaining walls and paving the community gathering space. 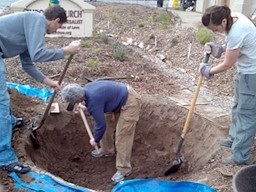 NELA Volunteers continued the community space pavement, placed cardboard and mulch, and continued work on the retaining wall. Progress has been dramatic. We started the weekend with a landscape riddled with irrigation trenches, french drains, hardscape and dirt piles everywhere. We finished with a good start on the patio, much of the ground filled and smoothed, a berm for the herb garden built, a retaining wall underway, and the first mulch on the ground. 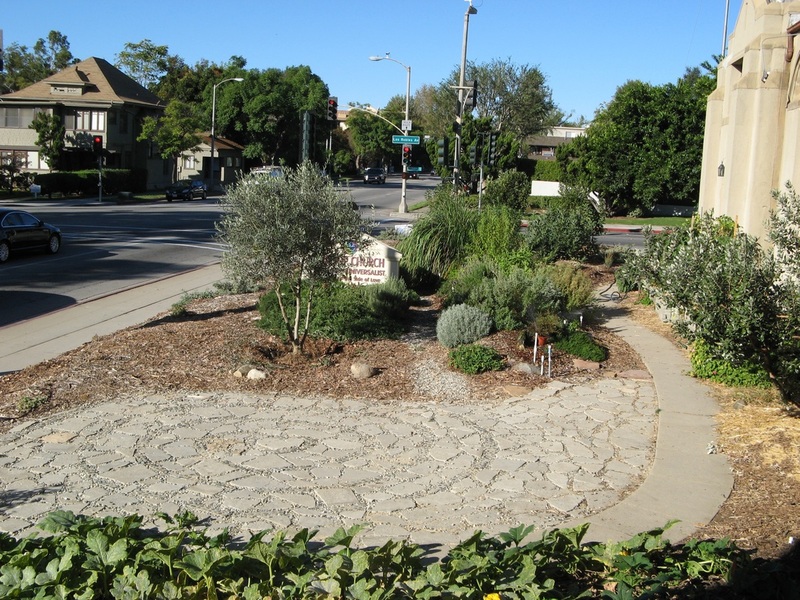 Completion of gravel filling the french drain along Del Mar, and commencement of irrigation trenching on the vegetable garden, and more stones were placed on the patio on Tuesday. NELA Volunteers leveled the low-water zone and created a transition zone for the eventual completion of the retaining wall and a back-filled third swale. It all worked very well. 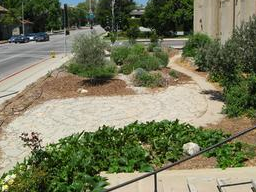 We tested the sprinklers on the herb garden, and selected sprinkler heads. 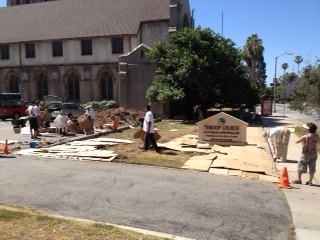 Good progress was made on the gathering space, it is really looking great. A swale was prepped and lined south of the herb garden, made ready for rubble and gravel. We worked out how to transition the cardboard at the swale-herb garden juncture as well as the swale at the low water zone juncture. Everything really starting to take shape. Exciting times! 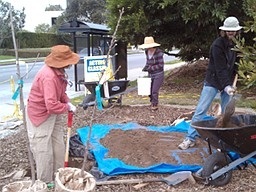 Four fruit trees were planted and much of the herb and dry garden zones. We added more roses to frame the main walk up to the church. Additional irrigation went in along the church wall. The shutoff valves were also installed. We've planted the Olive Tree and finished the gathering space! Yet more roses added along the main walk. Additional irrigation went in along the church wall. 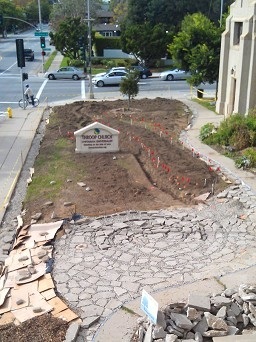 Additional herbs were planted in the herb garden and work continued on building the retaining wall. 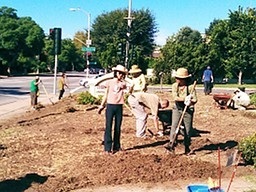 Some preparation of the vegetable bed took place, as well as additional testing of the irrigation system. We have come so far with the help of so many! Recycled cinder-blocks arrived the previous Saturday. One raised bed was constructed in the Learning Garden, with 3 more laid out. Serious progress. The Berm was mostly complete, and we mulched the West Lawn. 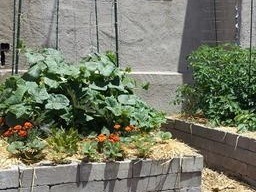 Thanks to all who helped finish the recycled cinder-block Learning Garden beds and planted all the vegetables and Nasturtiums. The roses were in full bloom; their sweet fragrance filling the garden, the vegetables had grown substantially, and the guava tree sported beautiful red and white blossoms – a promise of delicious fruit in the future. We planted more coral bells along the parking lot, and added sunflowers, squash, and nasturtiums to the Learning Garden. More progress was made on the hardscape. The terrace wall completed, and the raised beds were burgeoning with growing plants. All principal planting and construction was completed! We faced another 1400 square feet of Bermuda grass in a solid clay soil. Seventeen people showed up for the challenge. We broke into teams: trenchers, cardboard de-tapers, cardboard layers, water bearers. We laid cardboard in overlapping layers until the lot was completely covered, then covered over with massive amounts of mulch, covering the lot to 4 inches deep. 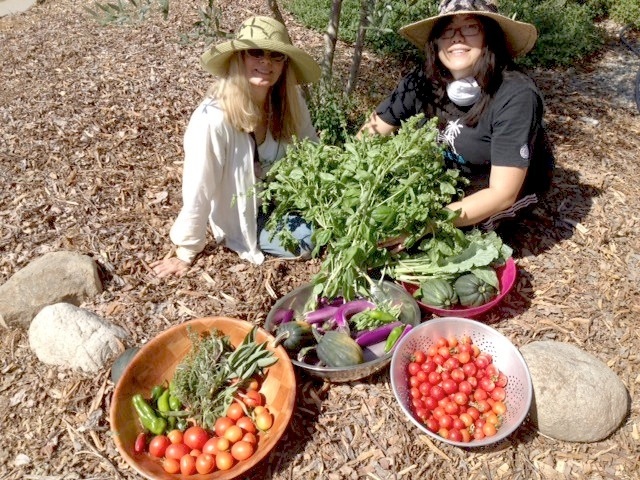 We enjoyed very good yields from the garden, averaging 50-75 pounds of tomatoes, eggplant, squash, beans, greens, sunflowers, herbs, and pumpkins every week! The new pastor, Rev. Tera Little has been integrating the garden into the church service, and we were honored to offer a garden tour to our 7th District councilperson, Mr. Terry Tornek on August 28th. 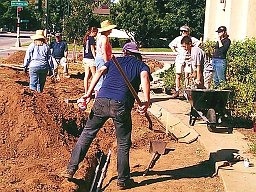 As we mark our first anniversary of the lawn conversion, we can count the milestones: covering the lawn with lasagna mulch, constructing the patio and terrace-walls, planting fruit trees in the food forest, planting the Cal Tech-donated Olive Tree, putting in the herb garden, and installing the raised-bed vegetable garden. Beyond these milestones we constructed something far more precious: community. 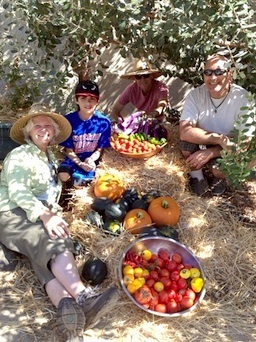 We forged new friendships and alliances, brought new skills and awareness to many people, built a habitat for birds, bees, and earthworms, and produced countless bushels of nourishing produce that we could share with a wide variety of folks. While the garden alone will not ensure us food security, it is part of a path to more interdependent, healthy future. Heartfelt thanks to all who participated.